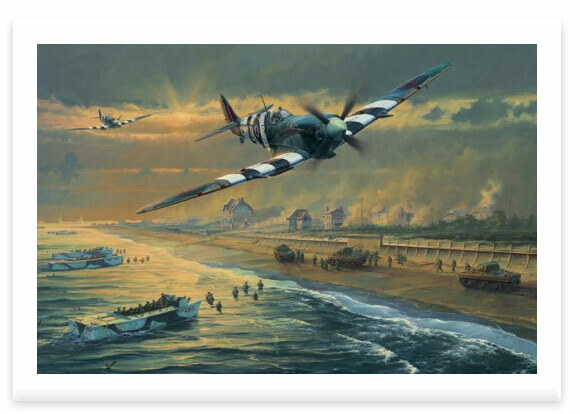 As shells from the naval bombardment whistle overhead, and ground-fire crackles around them, a pair of Mk IXb Spitfires from 412 Canadian Squadron make a fast run over Juno Beach, in support of the Third Canadian Division storming ashore. Landing craft negotiate their way through choppy seas and mined beach obstacles to discharge men at the water’s edge, ready to assault the high sea wall, as tanks begin to open fire on nearby enemy positions. 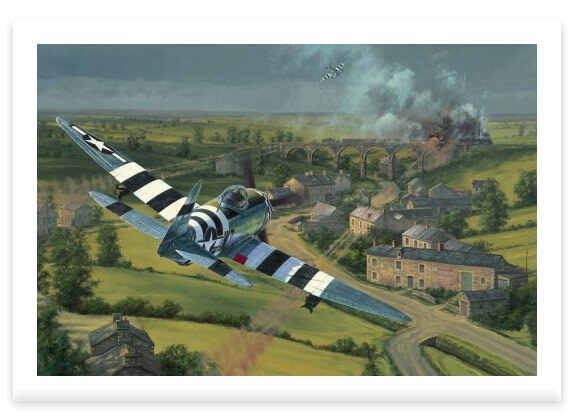 Each print is signed by two highly distinguished Spitfire pilots who flew combat over the D-Day invasion beaches. Free Wallpapers for your PC! Get instant access to two exclusive military aviation wallpapers for your PC. Simply join our FREE mailing list below!. © 2019 The Colours Call Online Military Art Gallery. All Rights Reserved. All Trademarks Acknowledged.